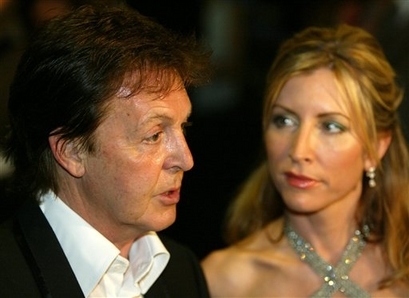 Sir Paul McCartney's ex-wife Heather Mills has been injured in a skiing accident. The charity campaigner – who was accepted on to the British Disabled Ski Team last month – sustained the injury to her leg when skiing at 100 kilometres per hour during a 24-hour race. She tweeted: "In Austria for the Schladming night race, can't ski though as injured good knee in charity 24 hr ski race when public were let on the race track whilst skiing 100 kmph + Should be good to ski again soon. (sic)"
The 43-year-old former model – who lost her left leg in a road accident in 1993 – is training hard in the hope of being selected as a participant for the 2014 Paralympics’ Games in Russia, which she says would be a "dream come true". Heather recently explained: "Nobody is on the Paralympic Team until three months before those games. If you're lucky enough to get on the team, which I am, you get a trial for a year. If I managed to compete, it would be phenomenal - very inspiring for all the kids that I counsel. "They didn't believe they could do anything and now they are trying ice skating and rollerblading and biking and swimming, which is wonderful. Having loved sport my whole life, competing in a Paralympics would be a dream come true."